24 August 2009, at 1:05p.m. Dr Gerd Müller, the Parliamentary State Secretary from the German Federal Ministry of Agriculture and his delegation recently visited Big Dutchman Asia (BD Asia) in Shah Alam, Malaysia. 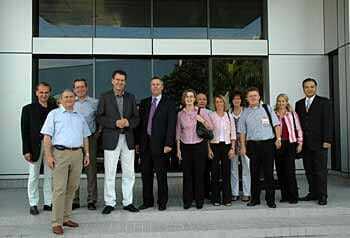 The visit to the subsidiary of the German Big Dutchman Group took place within the context of an official trip to Asia. BD Asia's management team, namely Brian McCawley, Vice President Sales & Marketing Asia, Kok Fatt Chin, Vice President Purchase & Logistics and Chris Tay, Controller, were present to extend a warm welcome to the guests and provided them with extensive information about products and activities of the world's leading supplier of poultry and pig equipment in Asia Pacific. The State Secretary was particularly impressed by Big Dutchman's 4,000-square metre logistics centre located just outside Kuala Lumpur. "With the establishment of a regional logistics centre in Malaysia, we now have a network of partners and suppliers offering more cost-effective quality solutions and faster responses to the needs of our customers in Asia and Oceania regions. The logistics centre was specifically targeted to serve our customers in line with BD's philosophy of 'customer first'," Brian McCawley explained to the visitors. On the visit to BD Asia: The BD management team Brian McCawley (fifth from left), Chris Tay (seventh from left) and Kok Fatt Chin (far right) receive the guests from Germany. Parliamentary State Secretary, Dr Gerd Müller (fourth from left) is accompanied by a delegation.